For other uses, see Triglav (disambiguation). Triglav (pronounced [ˈtɾiːɡlau̯]; German: Terglau, Italian: Tricorno), with an elevation of 2,863.65 metres (9,395.2 ft),[notes 1] is the highest mountain in Slovenia and the highest peak of the Julian Alps. The mountain is the pre-eminent symbol of the Slovene Nation. It is the centrepiece of Triglav National Park, Slovenia's only national park. Triglav was also the highest peak in Yugoslavia before Slovenia's independence in 1991. Various names have been used for the mountain through history. An old map from 1567 named it Ocra mons, whereas Johann Weikhard von Valvasor named it Krma in the second half of the 17th century. According to the German mountaineer and professor Adolf Gstirner, the name Triglav first appeared in written sources as Terglau in 1452, but the original source has been lost. The next known occurrence of Terglau is cited by Gstirner and is from a court description of the border in 1573. Early forms of the name Triglav also include Terglau in 1612, Terglou in 1664 and Terklou around 1778–89. The name is derived from the compound *Tri-golvъ (literally 'three-head'—that is, 'three peaks'), which may be understood literally because the mountain has three peaks when viewed from much of Upper Carniola. It is unlikely that the name has any connection to the Slavic deity Triglav. In the local dialect, the name is pronounced Tərgwòu̯ (with a second-syllable accent) in contrast to standard Slovene Tríglav. The highest peak is sometimes also called Big Mount Triglav (Slovene: Veliki Triglav) to distinguish it from Little Mount Triglav (Slovene: Mali Triglav, 2,738 meters or 8,983 feet) immediately to the east. The first recorded ascent of Triglav was achieved in 1778, on the initiative of the industrialist and polymath Sigmund Zois. According to the most commonly cited report, published in the newspaper Illyrisches Blatt in 1821 by the historian and geographer Johann Richter, these were the surgeon Lovrenz Willomitzer (written as Willonitzer by Richter), the chamois hunter Štefan Rožič, and the miners Luka Korošec and Matevž Kos. According to a report by Belsazar Hacquet in his Oryctographia Carniolica, this happened towards the end of 1778, by two chamois hunters, one of them being Luka Korošec, and one of his former students, whose name is not mentioned. Triglav's height was first measured on 23 September 1808 by Valentin Stanič. The first to put the name of the mountain on a map, written as Mons Terglou, was Joannes Disma Floriantschitsch de Grienfeld, who in 1744 published the map Ducatus Carniolae Tabula Chorographica. The first map its name appeared on written as Triglav was Zemljovid Slovenske dežele in pokrajin (Map of Slovene Lands and Provinces) by Peter Kosler, completed from 1848 until 1852 and published in Vienna in 1861. During World War II, Triglav symbolically captured the primary drive by the Slovene resistance to the Fascist and Nazi armies. The Slovene Partisans wore the Triglav cap from 1942 until after 1944. Triglav was the highest peak of the now defunct Yugoslavia; it was both countries highest and most prominent peak and, together with the southern Vardar River (now in North Macedonia), was the symbol of Yugoslavian "brotherhood and unity". At the top of the mountain stands a small metal structure, the Aljaž Tower (Slovene: Aljažev stolp). It acts as a storm shelter and a triangulation point. Along with Triglav, it is also a landmark of Slovenia and a symbol of the Slovenes and Slovene territorial sovereignty. The tower's namesake was the priest, mountaineer and patriot Jakob Aljaž. In early 1895, he drew up, with a piece of chalk on the floor of his room in the parish of Dovje, plans for a cylindrical tower with a flag on its top. In April that year he purchased the summit of Triglav for the sum of one Austro-Hungarian gulden. Having done so, he secured himself the right to erect a building on the mountain top. The tower was constructed from iron and zinc coated sheet steel by Anton Belec from Šentvid near Ljubljana. He and four workers brought the parts of the tower to the summit of Triglav and put the tower together in only five hours on 7 August 1895. The opening took place that same day. Aljaž donated the shelter to the Slovene Alpine Society. In the beginning, there were three four-legged chairs, a summit register, a spirit stove, and the image Triglav Panorama by Marko Pernhart in the tower. It was later repainted and renovated several times by Alojz Knafelc and others. In the Communist era, as the highest point of the former Yugoslavia, it was painted red and decorated with a red star. However, it has now more or less been restored to its original appearance. The star was removed shortly before the dissolution of Yugoslavia. On the proclamation of Slovene independence in June 1991, the flag of Slovenia was raised on top of the tower. In 1895, due to a lack of space, Aljaž also commissioned the building of the Stanič Shelter. It is located 55 metres (180 ft) below the top of Triglav and is named after the poet and mountaineer Valentin Stanič. The shelter has dimensions of 2.4 m × 2.2 m × 2 m (7 ft 10 in × 7 ft 3 in × 6 ft 7 in) and has room for 8 people sitting or 16 standing. Originally it also had a wooden door, benches, a table, and a chair. Its significance diminished after the Kredarica Lodge was erected in 1896. The Triglav Glacier (Triglavski ledenik) is located below the summit on the karstified Triglav Plateaus (Triglavski podi), part of the northeastern side of the mountain. Covering over 40 hectares (99 acres) at the end of the 19th century, the glacier had shrunk to 15 hectares (37 acres) by 1946, and after further shrinkage had fallen into two parts by 1992. It now covers an area of only 1–3 hectares, depending on the season. The Triglav area is the setting of an old Slovene folk tale concerning a hunter seeking a treasure guarded by an enchanted chamois buck named Zlatorog (Goldhorn, after its golden horns). The earliest known depiction of Triglav is on the front page of the work Oryctographia Carniolica, written by Belsazar Hacquet. It was a copper engraving made in 1778 by C. Conti after a drawing by Franz Xaver Baraga. Among later visual artists who depicted Triglav, the most well known are Anton Karinger (1829–1870) from Ljubljana, Marko Pernhart (1824–1871) from Klagenfurt, Valentin Hodnik (1896–1935) from Stara Fužina, Edo Deržaj (1904–1980) from Ljubljana, and more recently Marjan Zaletel (born 1945), living in Ljubljana. Among the musical works related to Triglav, a special place is held for the poem Oh, Triglav, My Home (Oj, Triglav, moj dom). It was written in 1894 by the priest and poet Matija Zemljič and quickly became very popular among Slovene mountaineers. In 2007, its first stanza, accompanied by a melody of Jakob Aljaž, became the official anthem of the Alpine Association of Slovenia. An instrumental version of the poem, written by Bojan Adamič, is part of the start and end credits of the annual ski jumping broadcasts from Planica. The first Slovene-language full-length film, recorded in 1931 by Janko Ravnik, was titled In the Kingdom of the Goldhorn (V kraljestvu Zlatoroga) and features an ascent by a group of students to the top of Triglav. The second Slovene full-length film, recorded the following year, was titled The Slopes of Mount Triglav (Triglavske strmine). It was directed by Ferdo Delak and was a romantic story featuring a wedding on the top of Triglav. Since 1968, Triglav has become a theme of avant-garde artists. The first instance was a manifestation by the art group OHO, called Mount Triglav, which took place in December 1968 at Ljubljana's Congress Square. In 2004, the group IRWIN produced a series of paintings named Like to Like/ Mount Triglav. In 2007, an artistic performance was held atop Mount Triglav by the artists Janez Janša (director), Janez Janša (visual artist) and Janez Janša (performance artist) called Mount Triglav on Mount Triglav. A stylized depiction of Triglav's distinctive shape is the central element of the Slovene coat of arms, designed by the sculptor Marko Pogačnik, and is in turn featured on the flag of Slovenia. Alongside San Marino and Slovakia, Slovenia is the only other country in Europe and one of the few in the world to feature a mountain on its coat-of-arms. Formerly, it was featured on the coat of arms of the Socialist Republic of Slovenia. The first to depict Triglav as the symbol of the Slovenes was the architect Jože Plečnik, who in 1934 put it besides other coats-of-arms of the nations of the Kingdom of Yugoslavia on the coat of the statue of the Mother of God in front of the parish church in Bled. During World War II, the stylised Triglav was the symbol of the Liberation Front of the Slovene Nation resistance movement. The distinctive three-pronged caps worn by Slovene Partisans during World War II were known as triglavkas. A relief map of the mountain is the design on the national side of the Slovene 50 eurocent coin. The former Slovene president Milan Kučan once proclaimed that it is a duty of every Slovenian person to climb Triglav at least once in their lifetime. ^ According to the measurement performed in 1985 from the Trenta Valley by the Geodetic Institute of Slovenia, it had an elevation of 2,864.09 ± 0.032 metres (9,396.62 ± 0.10 ft). A new measurement by the Slovenian Surveying and Mapping Authority in 2016 showed an elevation of 2,863.65 metres (9,395.2 ft). ^ a b Banovec, Tomaž (March 1986). "Triglav, 2864 metrov" [Triglav, 2864 meters]. Planinski vestnik (in Slovenian). LXXXVI (3): 106. ^ "Kako visok je v resnici Triglav" [How High Is Triglav Actually?]. Siol.net (in Slovenian). 22 November 2016. ^ Orožen, Fran (December 1903). "Kaj pripoveduje Valvasor o Krmi (Triglavu)" [What Does Valvasor Say about Krma (Triglav)] (PDF). Planinski vestnik (in Slovenian). IX (12): 201–202. ISSN 0350-4344. ^ Zorzut, Ludovik (July 1961). "Odkrite zanimivosti" [Interesting Facts Discovered]. Planinski vestnik (in Slovenian). XVII. p. 330. ISSN 0350-4344. ^ Golec, Boris (2001). "Iz zgodovine pisarniške slovenščine v 1. polovici 18. stoletja" [From the History of Administrative Slovene in the First Half of the 18th Century] (PDF). Arhivi (in Slovenian). XXIV (1): 100. ^ Snoj, Marko. 2009. Etimološki slovar slovenskih zemljepisnih imen. Ljubljana: Modrijan and Založba ZRC, p. 439. ^ Bezlaj, France. 2005. Etimološki slovar slovenskega jezika, vol. 4. Ljubljana: Slovenska akademija znanosti in umetnosti, p. 224. ^ Slovenska zemlja: opis slovenskih pokrajin v prirodoznanskem, statistis̄kem, kulturnem in zgodovinskem obziru. Ljubljana: Matica slovenska. 1892. p. 21. ^ Merrill, Christopher (2001). Only the Nails Remain: Scenes from the Balkan Wars. Lanham, MD: Rowman & Littlefield Publishers. p. 52. ^ Gabrovec, Matej; et al. (2014). "Najstarejši kartografski prikazi, pisne omembe in likovne upodobitve" [The Oldest Cartographic Depictions, Written Mentions and Visual Depictions]. Triglavski ledenik [Triglav Glacier]. Založba ZRC. pp. 26–27. ISBN 9789612547318. ^ a b Mikša, Peter (2014). "Exploring the Mountains – Triglav at the End of the 18th Century". In Štih, Peter; Zwitter, Žiga (eds.). Man, Nature and Environment between the Northern Adriatic and the Eastern Alps in Premodern Times. Znanstvena založba Filozofske fakultete Univerze v Ljubljani [Ljubljana University Press, Faculty of Arts: Historical Association of Slovenia]. pp. 202–215. ISBN 978-961-237-723-6. ^ Drago, Perko (2001). Analiza površja Slovenije s stometrskim Digitalnim modelom reliefa [Analysis of the Surface of Slovenia with a 100-meter Digital Model of the Relief]. Ljubljana: Založba ZRC. p. 41. ^ Fridl, Jerneja; Renata, Šolar (2011). "Vpliv razvoja kartografskih tehnik na podobe zemljevidov slovenskega ozemlja od 16. do 19. stoletja" [The Influence of the Development of Cartographic Techniques on the Appearances of the Maps of the Slovene Territory from the 16th Until the 19th Century]. Knjižnica (in Slovenian). Zveza bibliotekarskih društev Slovenije. 55 (4). ^ Debeljak, Aleš; Snel, Guido (2004). "Dreaming of Friends, Living with Foes". Alter Ego: Twenty Confronting Views on the European Experience. Amsterdam University Press. p. 57. ISBN 978-90-5356-688-6. ^ Luštek, Miroslav. "Nekaj zunanjih znakov partizanstva" [Some External Signs of the Partisan Movement]. In Bevc, Milan. ; et al. (eds.). Letopis muzeja narodne osvoboditve 1958 [The Yearbook of the Museum of the National Liberation 1958] (in Slovenian and French). II. Museum of the National Liberation of the People's Republic of Slovenia. COBISS 172143. Archived from the original on 15 May 2013. Retrieved 22 February 2012. ^ "Ali ste vedeli ..." [Did You Know...]. Slovene Alpine Museum. Retrieved 27 May 2014. ^ Mikša, Peter. "Narodnostni boji v planinstvu na Slovenskem do 1. svetovne vojne" [National Battles in the Mountaineering in the Slovene lands Until World War I] (in Slovenian): 65–68. ISSN 1318-2498. ^ "Aljažev stolp vrh Triglava" (in Slovenian). Mountaneering club Ljubljana-Matica. Archived from the original on 27 December 2007. Retrieved 13 November 2007. ^ Cvirn, Janez (2000). Vidic, Marko (ed.). Ilustrirana zgodovina Slovencev. Mladinska knjiga. p. 271. ISBN 86-11-15664-1. ^ a b Bartolj, Jaka (17 December 2013). "Jakob Aljaž built a tower that has become a Slovenian symbol". MMC RTV Slovenija. RTV Slovenija. ^ a b Belimezov, Maja (25 July 2007). "Stolp ima 110 let" (in Slovenian). Gore-ljudje.net. Retrieved 12 September 2008. ^ Pavšek, Miha; Gabrovec, Matej; Triglav Čekada, Mihaela (2008). 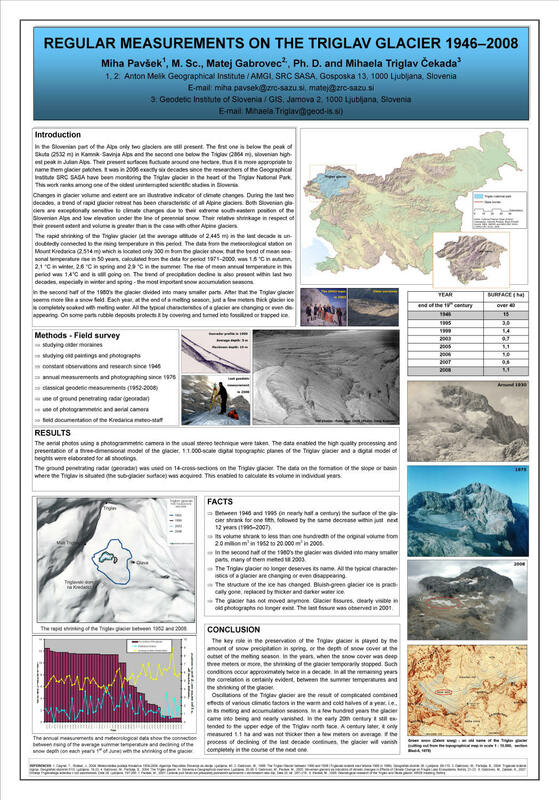 "Regular Measurements on the Triglav Glacier 1946–2008: A Poster". Geographical Institute of Anton Melik, Scientific Research Centre of the Slovene Academy of Sciences and Arts. ^ a b Gabrovec, Matej; Pavšek, Matej (2 November 2011). "Spreminjanje obsega ledenika" [Changes of the Extent of the Glacier] (in Slovenian). Environmental Agency of the Republic of Slovenia, Ministry of Agriculture and Environment. ^ Savenc, Franci (2 April 2009). "Zgodovina slovenskega planinstva". Gore-ljudje. ^ Zupan, France (June 2006). "Bog Pan pride na Bivak za Akom" [Pan the God Comes to the Shelter Behind Ak]. Planinski vestnik (in Slovenian). Mountaineering Association of Slovenia. 111 (6): 6–13. ISSN 0350-4344. ^ Bradeško, Marjan (June 2006). "Goram dajejo novo razsežnost" [They Give Mountains a New Dimension]. Planinski vestnik (in Slovenian). Alpine Association of Slovenia. 111 (6): 14–21. ISSN 0350-4344. ^ Šuvaković, Miško (2007). "3x Triglav: kontroverznosti in problemi okrog Triglava" [3x Triglav: Controversies and Problems Regarding Mount Triglav] (PDF). Axioma. ^ "Zakon o grbu, zastavi in himni Republike Slovenije ter o slovenski narodni zastavi" [The Law on the Coat of Arms, the Flag and the Anthem of the Republic of Slovenia and on the Slovene National Flag]. Uradni list [Official Gazette] (in Slovenian). 21 October 1994. ^ a b c Otorepec, Božo (1997). "Triglav: ein Symbolberg" [Triglav: a Symbol Mountain]. Les Alpes de Slovénie = Die Alpen Sloweniens (in German and French). pp. 137–142. ISBN 3-905312-38-7. COBISS 8328237. Wikimedia Commons has media related to Triglav. Julian Alps: Triglav Hribi.net. Detailed information and images. Julian Alps: Triglav. SummitPost.org. Detailed information, maps and images.